I can’t think of another franchise that has delivered with such consistency as the Kung Fu Panda movies, which frankly seem to be raising expectations with each new installment. It’s a particularly commendable achievement at a time when it’s hard to approach any sequel without some degree of cynicism or fatigue. The story may be slight – it’s never as inventive as some of Pixar’s best work – but this is a charming film with plenty laughs for both the young and the young at heart. I’m going with three-and-a-half out of five. The franchise creates delightful myths and notions of mystical powers, of daunting designations like the dragon warrior or the key to the universe it possibly holds yet revels in revealing their ineffectiveness in absence of soul and endeavour. Believe in yourself, your best self and things just fall in place; it seeks to tell children and adults. From elegant animation to Po’s real name, there’s much to learn and love about the newest Kung Fu Panda movie and its fabulous, floundering, furry hero. Witness him. The film offers entertainment for children while being substantive enough to keep the parents engaged. What it is not, is fresh. It offers everything we have come to expect from the franchise without breaking any new ground. The sense of wonder that we associated with the first two films is missing this time round. And that is disappointing coming from a film whose tagline is, “Be the best you can.” For those who are asking, this film doesn’t live up to the high standards set by the first two parts but still manages to stay endearing and fun, like a giant panda hug. Go for it and take your parents along! Directors Jennifer Yuh Nelson and Alessandro Carloni deploy a gorgeous color palette for the Chinese countryside, using vibrant, swirling shades of green, blue and red for the panda hideaway. Rich golden tones color the Spirit Realm, where some of the climactic fights take place. The directors also make sure to let Po stay the charming bumbler he’s always been. That’s what makes him such an earnest, lovable hero. It’s also what makes this franchise such a winner. As the cuddly Chosen One comes to terms with his own destiny, he helps everyone else discover their best selves, too. Thankfully, the abundant humour and various witty asides also steers things clear of a sucrose overdose. While the voice casting is spot on, there are perhaps, a larger number of characters than necessary. Although a slightly over-dramatic ending holds the film back from greater heights, this is on the whole, quite enjoyable for kids as well as adults. With a solid base for a narrative, directors Jennifer Yuh Nelson and Alessandro Carloni make the most of the budget and the cutting edge animation technology to render a movie that doesn’t bore for a single moment. There’s always something hilarious, or action packed, or adventurous, or heartfelt happening on screen. If you loved the off kilter slapstick comedy of the first movie you’ll receive a lot more of the same in this movie. Despite this, KUNG FU PANDA 3 is highly moving with a great message that focuses on family and knowledge. Kids especially are likely to relate to the happenings on screen and will certainly enjoy the fun light moments that are generously spread across the film.On the whole, KUNG FU PANDA 3 is an entertaining film, however, you will be left wanting more. In the Chinese Spirit Realm, Master Oogway (Randall Duk Kim) fights against an adversary named Kai, (J. K. Simmons) who has defeated the other masters in the realm and taken their chi, but willingly gives in and also has his chi stolen, but not before warning Kai that the Dragon Warrior, Po (Jack Black), will stop him. Kai takes this as a challenge to steal the chi from the Dragon Warrior and returns to the mortal world using masters’ chi. Meanwhile, Master Shifu (Dustin Hoffman) announces his retirement and passes the role of teacher to Po. 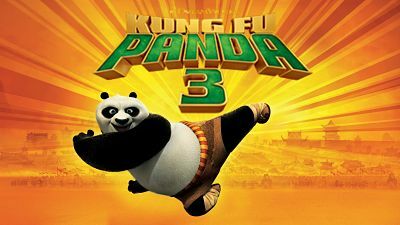 Po is excited at first, but discovers that teaching kung fu is not as easy as he expected, as the Furious Five members Tigress (Angelina Jolie), Crane (David Cross), Mantis (Seth Rogen), Viper (Lucy Liu), and Monkey (Jackie Chan) are injured as a result. Po is demoralized as a teacher, which makes him question who he really is and whether he is the Dragon Warrior. In response, Shifu advises Po that instead of trying to be a teacher, he should try to be himself.